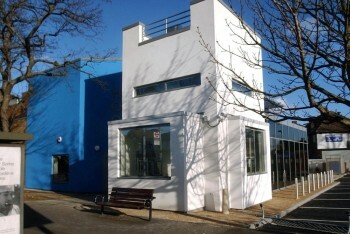 There are two entrances into a large and spacious foyer with a cafe and Council Information Point. The entrance to the library next to the reception desk and the library counter and reception area are adjoining. The general principle is to reduce backroom activities so the counter acts as workroom to allow staff to be available to help. A unique suspended ceiling design feature in the entrance hall has two purposes - to break up the height and to protect staff below from items which could drop from the internal window spaces above. There is self service RFID. The shelving is deliberately utilitarian to allow easy replacement. 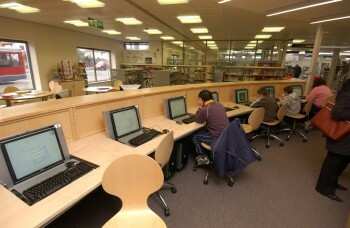 The computers both in the main library and the Learning Centre are on fold-down tables so that the desking can act as a study table. There is a meeting room and two small interview rooms available for hire.